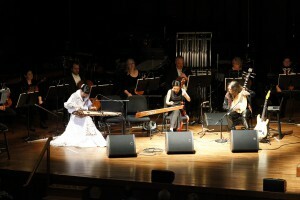 “Nam Maí, for three soloists, nineteen string instruments and film, was composed for the extraordinary Vietnamese/Swedish trio The Six Tones and the string players of the Seattle Symphony. I have worked with The Six Tones (Ngô Trà My, Nguyễn Thanh Thủy and Stefan Östersjö) and writer/director Jörgen Dahlqvist on a few large-scale pieces, including Idioms, a theater work for the trio plus three actors and live electronics. More recently, we collaborated on Seven Stories, a feature-length dance film inspired by traditional Vietnamese Tuồng theatre subjects, which added choreographer Marie Fahlin to our artistic group. The above comment from the American composer Richard Karpen, a pioneer of electronic music and professor of composition at University of Washington, summarizes the content of this ground-breaking multi-media work for traditional Vietnamese instruments, film and symphony orchestra. The film and the live-choreographed movements refer to material from traditional Vietnamese Tuồng theatre but, just as the music transforms a traditional musical material, the film provides a contemporary reading of these ancient tales. 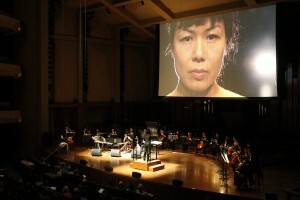 Nam Maí will be recorded on CD by the Seattle Symphony and The Six Tones in autumn 2014.